Posted on Fri, Jan 27, 2012 : 4:08 p.m.
A Chelsea council member wants to ensure that the city’s use of public spaces treats all groups equally. The situation began last November when he received a complaint from a resident that the city would not allow a live nativity scene to take place on city-leased property during an annual December festival. Chelsea Councilman Rod Anderson said he is trying to “make the city acknowledge it doesn’t discriminate against religious events,” and thinks that a policy should be established by the City Council. “Government’s authority to constrain free speech, including religious speech during an event,” is at the crux of Anderson’s concerns, after the nativity scene was disallowed. The First Amendment states: "Congress shall make no law respecting an establishment of religion, or prohibiting the free exercise thereof; or abridging the freedom of speech, or of the press, or the right of the people peaceably to assemble, and to petition the Government for a redress of grievances." Councilwoman Cheri Albertson agrees that the city “needs a policy for city-owned public places; who and how spaces can be used, but this policy has nothing to do with religion or free speech,” she said. Anderson said there need to be rules about events in the city that will treat religious and non-religious events alike. In previous years, a group held a living nativity event as part of the holiday festival in a number of different locations downtown - including on city-owned land at the corner of Orchard and Main streets. During the past several years, the living nativity event took place on the Palmer Ford parking lot, which was privately owned. However, the lot was recently leased by the city, and the group was asked to move the event to another location. This year, it took place on the west side of the Methodist Church on Park Street. 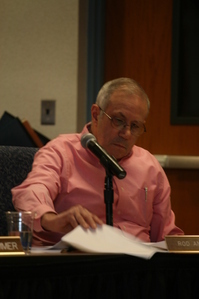 Anderson brought the complaint to the Chelsea City Council last month and requested that they discuss the situation. He even consulted with the American Center for Law and Justice for help. The center was part of a Supreme Court ruling in a case called Lamb’s Chapel v. Center Moriches School District, which involved a church-related use of public space. "Although the school facilities were available to community groups for social, civic, and recreational purposes, the rules and regulations specifically prohibited any religious use. The Supreme Court ruled (unanimously) against this prohibition, stating that the religious exclusion was unconstitutional,” according to a synopsis of the case. On Tuesday night, Anderson handed out background informationEqual access info.pdf he’d compiled on the use of public spaces for religious purposes, which laid out the “genesis” of the issue in Chelsea. He also included proposed language for regulations. In part, it reads, “A private individual, group, or entity may use city property to conduct a religious or seasonal event, subject to reasonable time, place, and manner regulations.” Read the full document hereReligious event wording.pdf. He told the City Council that he vetted the proposed language through the center and offered it to the council for consideration. Since, he said, "The (Palmer) property is planned for other “secular uses,” there should be some sort of a policy in place for the use of public areas for all religious uses." Currently, the only policy in place for the use of public places, City Manager John Hanifan said, was for farmers markets. “As a city, we can regulate a farmers’ market, that’s it,” he said, adding there are no city regulations for a Frisbee tournament or a dog show or even a Boy Scout event. Hanifan said the city “doesn’t allow or disallow anything else” and he provided the City Council with policies from several other municipalities for the use of public land. Several of the City Council members felt that the regulations presented from other municipalities were “onerous,” and wanted the Planning Commission to take a look at the issue. Plus, City Council members said, they were hesitant to vote on something that they just received that night. Albertson said that she’s a huge advocate for freedom of speech. “To say that I’m for freedom of speech is a huge understatement,” but she thought the draft language Anderson had given the City Council was “a Pandora’s box,” and went further than it needed to. “This is fraught with significant inherent complexities and it’s a complicated issue. We need to look at what is in Chelsea’s best interests,” she said. Anderson disagreed and said he didn’t see this as a planning issue, but rather a City Council policy decision. The motion did not include the language provided by Anderson for a policy for religious use, and Anderson voted against it. 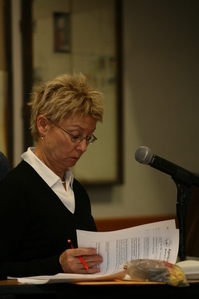 Albertson, who is the council’s liaison to the Planning Commission, offered to take his concerns to the planners, but Anderson declined her offer. “The City Council is totally missing the point. If secular events are allowed, religious ones must be as well,” he said. Anderson sent a synopsis of Tuesday night’s discussion to the American Center for Law and Justice and their position is "regardless of the language in any city ordinance or other code, the city is still bound by the Constitution, in that they may not discriminate against religious groups wanting to hold events in public spaces." If there are any cases of such discrimination, ACLJ asked to be contacted for appropriate legal action, he said. "Since the city is unwilling to modify its code to formalize a public policy that explicitly complies with constitutional limits, it is necessary to alert the community that legal redress is available in the event of discrimination and they should contact me if they encounter such," Anderson said. Sun, Feb 5, 2012 : 11:58 a.m. If there were agreement on religion in Chelsea, there would be only one church. Since there are many, clearly there is disagreement. As such, religious displays and enactments should take place on the property of the church or other group sponsoring the religious display. As others have noted, the reaction would certainly be different if the group involved were Buddhist, Muslim, Wiccan or Hindu. They deserve freedom of religion as well. The city has to be in a position of treating all such groups equally, irrespective of who is or is not a member of the congregation involved. It is entirely appropriate that the secular government not allow religious enactments on its property. Thu, Feb 2, 2012 : 11:32 a.m. The American Center for Law and Justice was founded by Pat Robertson. Do you really think you'll get a neutral opinion about this issue from that group? Sun, Jan 29, 2012 : 1:39 a.m.
Re=read the Constitution, particularly Article VI. Church &amp; state are emphatically separated. Read, also, the recent article in the Smithsonian about Roger Williams, founder of Rhode Island, for an emphatically Christian abhorance of state-approved religion. Sun, Jan 29, 2012 : 6:04 a.m. There is nothing in Article VI mentioning a &quot;wall of separation&quot; between church and state. VI just says there can be no religious test as a qualification for public office. Try again. Sun, Jan 29, 2012 : 1:25 a.m. This country most assuredly was not established by and for Christians. I am, quite certain there would be a huge uproar if a Pagan, Wiccan, Muslim, or Atheist group wished to hold a ritual or holiday get together on government property. Keep religion out if our government, it you may be sorry what you wish for. Sun, Jan 29, 2012 : 6:12 a.m.
How about you realize that government must stay out of religion for a change! Government has no power to restrict the free exercise of religion says the 1st Amendment. If people want to hold hands and pray in a park, they can. If they want to dress up funny and hold a shepherd's crook in a lot owned by the city, they can. If they want to sit on a bench at city hall and pray out loud to Allah or Apollo, no problemo. Any policy by any city to ban religious groups from using a park, unless that park simply disallows any use at all, will be found unconstitutional. Why do you hate religion so much, anyway? Sat, Jan 28, 2012 : 7:53 p.m.
Well here we go again, I don't know how many times that I have read that this country was not founded under Faith of Man. If some of you, especially the people making the rules in our villages, Cities, States, and the Federal Government, had studied the Declaration of Independence while in school, we might not have this problem. If some politicians would have studied the Declaration of Independence while in school, they would possibly remember the following: &quot; We hold these truths to be self - evident, that all men are created equally, that they are endowed by their Creator with certain unalienable Rights, that among those are Life, Liberty, and the prusite of Happiness&quot;. The above sentence is a moral standard to which the United States should strive. I do not agree that we need additional rules or laws. We ned to start to use our judgement on what is right or wrong for all of us. Time to The Declaration of Independence tells us who we are and why we are here, The Constitution is like an operations manual, should be telling or offering us guidance as to how we can survive. Please, No More Rules. Follow what we have!! Thank you. Sat, Jan 28, 2012 : 6:10 p.m. Sat, Jan 28, 2012 : 4:19 p.m. Sat, Jan 28, 2012 : 5:44 p.m. I don't live in Chelsea, and I don't pay a lot of attention to its local politics. Are church/state conflicts common there? If this is the worst of such matters in recent history, then it seems that the residents don't have a lot to worry about. There will always be some gray area where &quot;establishment of religion&quot; isn't so easy to establish. It's fine to anticipate conflicts and have some guidelines in place. However, the first amendment as interpreted by the courts already grants broad protections for nondiscrimination in use of public space. There's nothing here to suggest that the city of Chelsea is acting in conflict with that. Adding redundant, equally broad codes to the city charter doesn't serve any clear purpose in promoting free exercise of religion. It does, however, serve a pretty clear purpose in promoting Councilman Anderson. Sat, Jan 28, 2012 : 5:12 p.m. I think because the separation of Church &amp; state issue is such a recurring topic now, Councilman Anderson is just being proactive in his efforts to have a policy in place to ward off future problems, if done correctly. Sat, Jan 28, 2012 : 3:07 p.m. Sat, Jan 28, 2012 : 2:54 p.m.
No you don't need to look at what's best for Chelsea, you need to reread your constitution. Sat, Jan 28, 2012 : 2:31 p.m. Sat, Jan 28, 2012 : 1:37 p.m. The First Amendment states....&quot;Congress shall make no law respecting an establishment of religion, or prohibiting the free exercise thereof; or abridging the freedom of speech, or of the press, or the right of the people peaceably to assemble.... In my humble opinion, a live nativity scene is not a 'semi-permanent' display like many Christian(or secular) themed displays that are out in front of a Church or private homes through the month of December, 24/7. Isn't it more of a 'free exercise' event for 'people peaceably to assemble' to express their 'freedom of speech'? I don't believe they 'assemble' out there 24/7. What about those 'candlelight vigils' we often see on the news, aren't they sometimes a religious event too? Many are held on city property and offer prayers &amp; talk about how the person deceased 'is in a better place'. Doesn't that convey a faith in a particular religion also? I guess we can't have anything like this happening on city property now either. Mr. Anderson is correct- "...... If secular events are allowed, religious ones must be as well,"
Sun, Jan 29, 2012 : 5:33 a.m. Sat, Jan 28, 2012 : 5:13 p.m.
No, average, that's not what I'm saying. A nativity scene is a religious event while a picnic is just that, lunch. Using public space for religious events is not a good idea, IMO, and I think some try to create controversy with these issues. Have it on private property and it causes no issues. You know where I attended a live nativity event this past December? At a church. Guess what? No problems whatsoever from it. As for your throwaway comment about a &quot;prayer of thanks before the meal&quot;: That's just another red herring. You can pray quietly by yourself, anywhere, without anyone's consent. Sat, Jan 28, 2012 : 5:07 p.m.
JB- I don't believe 'live nativity' scenes are a religious 'event'. Are they not more or less perhaps a theatrical play, depending of course on how &amp; what they do while there? Are you also saying that a religious group cannot even have a 'Church picnic' at a city park unless they agree to not engage in religious activities like offering a prayer of thanks before the meal because that might be interpreted as a &quot;religious event&quot;? Sat, Jan 28, 2012 : 3:37 p.m.
No, he's not. Your logic is extremely squishy. Religious events should not take place on public property or with governmental sanction. The end. Sat, Jan 28, 2012 : 1:29 p.m.
Why can't these things happen on &quot;church&quot; property? Or donated property by a wonderful person? I force my beliefs on no one, I AM A TRUE PATRIOTIC AMERICAN. Sun, Jan 29, 2012 : 5:45 a.m. Sat, Jan 28, 2012 : 3:30 p.m. They don't force anyone to stop and watch. You are free to watch or not! Sat, Jan 28, 2012 : 1:22 p.m.
Mon, Jan 30, 2012 : 6:19 p.m.
Hmmm.... unless Chelsea council members are unpaid, they're spending tax dollars just discussing this issue. I'm non-religious and tend to think that way too much time is spent fighting over whether or not a nativity or menorah or whatever can be displayed on public property. The city puts up decorations for the holidays so what's the big deal about allowing people to peacefully stand around in &quot;togas&quot; re-enacting something that may or may not have happened 2000 or so years ago? As long as they're willing to clean up after themselves, or pay the city to do it for them, then, as citizens of the city, they should have peaceful use of city-owned property. All that said... did the city's lease with Palmer forbid ancillary uses or provide some other reason to ask the group to relocate? Sat, Jan 28, 2012 : 2:23 p.m.
Who is spending tax dollars on anything in this article? I'm not sure what you're talking about. Sat, Jan 28, 2012 : 1:24 p.m. Sat, Jan 28, 2012 : 12:15 p.m. I see nothing wrong with a nation that was established by and for Christians having a nativity scene. The Constitution gives us religious freedom. There is NO separation between church and state; just religious freedom. Back off people! Sun, Jan 29, 2012 : 2:15 a.m. It's worth noting that Americans United for Separation of Church and State, a non-partisan group that works to ensure religious freedom, is led by an ordained minister, Rev. Barry Lynn. Because very soon after govt shows preference for one religion or another, it will start showing preference for one denomination instead of others. Some religious people want to maintain separation of church and state for good reasons, not just atheists and agnostics. For example, if someone wanted to display the Ten Commandments or The Lord's Prayer on public property (and I don't see how a display is substantially different whether it's a sign or a sculpture or a &quot;living nativity&quot; scene), thinking that there would be no conflict between Christians, you'd have to ask which version of the Ten Commandments, or which version of The Lord's Prayer should be used. King James Version? New American Bible preferred by Catholics? Some of the differences in translations seem minor, but people are capable of arguing endlessly over these differences, just like every other aspect of scripture and dogma and interpretation. You're not arguing for religious freedom, because you already have that on your own property and lots of property owned privately and by churches. You're arguing for the right to practice or celebrate or advertise religion on public property too. The public should have some input on how public property should be used. It's not inhibiting religious expression or freedom of speech any more than if someone wants to display a statue of a football and the city or public decides it should not be on public property. Sat, Jan 28, 2012 : 5:53 p.m.
First, let's not pretend like this was &quot;a nation that was established by and for Christians,&quot; especially given how that contradicts the concept of religious freedom in the first place. Second, there can be no religious freedom without separation of church and state. Once the government is used to promote religion, thus begins the infringement of freedom of religion for all. Sat, Jan 28, 2012 : 5:16 p.m.
No, angry, I didn't miss the point. Religious events should occur on private property, not public property. That's the issue that goes directly to the point of separation of church and state. Many people have different beliefs and they shouldn't put them upon others just as I do not do so. Sat, Jan 28, 2012 : 5:08 p.m.
JB, you seem to have missed the point. The government is discriminating *against* religions by allowing the property to be used for everything except religion. &quot;There are more important issues&quot; is never an excuse for violating the first amendment. Sat, Jan 28, 2012 : 3:34 p.m.
&quot;There is NO separation between church and state; &quot; That's precisely the problem: You fail to recognize that there IS a Constitutionally-mandated separation between church and state. As for the issue at hand, other have already commented, correctly IMO, that the simple solution is to have it on private property. Were it done on public property, all religions would have to be afforded the same opportunity, both Christian and non-Christian. I personally don't care but how would you feel about that? Again, have it on private property. The state cannot appear to favor any particular religion so eliminate the appearance of conflict. Besides that, there are much more important issues to attend to than this that appears to be some sort of personal campaign by Mr. Anderson. Fri, Jan 27, 2012 : 10:44 p.m.
You can't swing a cat in Chelsea without hitting one church or another. Can't they get permission to use church property again? Did the Methodist Church on Park street give them trouble last year? If Chelsea prohibited all religious displays on *all property in the city*, that would be a matter of free speech. Whether some group can use city property is a different matter, especially when the solution to their problem is simply to get permission from a private property owner or church. The problem with allowing religious displays on government property is spelled out in that same sentence from the First Amendment quoted in this article: our governments are not supposed to establish a religion. I would hope that applies to federal, state or village governments. Meanwhile, churches are tax-exempt, so if any group can afford to put up more religious displays, they can. How much more discrimination *in favor of religion* do we need? Sun, Jan 29, 2012 : 2:31 a.m. Reply to Mr. Anderson... &quot;Displays may be regulated by the state since they may be used to infer the establishment of a certain religion. The Live Nativity event, however, was conducted by individuals who each have free speech rights protected by the Consitution. &quot; I don't see a substantial difference between a display (a sign or sculpture or monument?) and a live nativity event, when both are forms of expression. The weird thing about freedom of speech and the press is that we aren't guaranteed to have it everywhere, under all circumstances. It's like the old saying that the only people with freedom of the press are the people who own presses. Newspapers can refuse to print our letters or submissions. They're not violating our free speech by turning us down. TV stations can turn down our advertisements, or require payment for them. By that reasoning, people with more money have more freedom of speech or expression. But Chelsea is not violating anyone's freedom of speech or religion or assembly by turning down the live nativity event on city property. They still have the same right as anyone else to buy or rent private property for the event, or get some other private property owner's permission. Chelsea would be violating the first amendment if they allowed the live nativity on city property, for the same reason that you admitted it's a problem to have religious displays. Whether the display is live or motionless, it would still be used to reasonably infer the establishment of a certain religion. Many non-religious, no-profits are also exempt from certain taxes, but they are allowed to use city property for their 'events'. So your logic &quot;in favor of religion&quot; regarding taxes is weak. Sat, Jan 28, 2012 : 3:47 a.m.
Fri, Jan 27, 2012 : 10:35 p.m.
Good reporting Lisa. I'm wondering what the reason was that the event was denied use of the lot. It's not clear. Fri, Jan 27, 2012 : 10:23 p.m. The city just needs to print a very large banner with a disclaimer on it that it does not, in any way, endorse what is happening on their property and leave it at that. Fri, Jan 27, 2012 : 9:43 p.m. Sat, Jan 28, 2012 : 3:26 p.m.
Fri, Jan 27, 2012 : 10:48 p.m.
Fri, Jan 27, 2012 : 9:52 p.m.
Are you speaking of &quot;One nation, under God&quot;, which was added in the 1950's, and could not represent what American freedom stands for any less?